This mug is a must for any tea drinker. It's so practical. Glass inside for health purposes and poly on the outside for durability on the go. The lid un-screws to reveal a screened dip for loose tea. 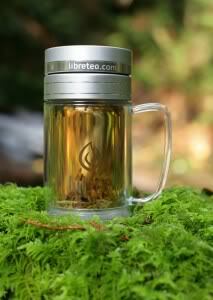 You place your loose tea inside, pour your water, seal the lid, and allow to brew right in the mug. Again, perfect for on the go tea. I brew a lot of medicinal type teas and they generally come loose. This mug is wonderful even when not on the go. No need for a tea ball - it all takes place right in your mug! I love that the brewing takes place in glass. Now to the ethtetics. This mug is beautiful. On top is a delicate gold design. This mug makes a really nice gift for any tea drinker, health conscious person, or someone who's on the go a lot. I kept thinking, "I'm so glad they made this" the whole time I was using it.